We kick of this month with this attractive 1900 1/2d green franking with a scarce “Posted out of course” handstamp. This handstamp indicated that this registered envelope was probably placed straight into a postbox instead of being handed over at the Post Office as was required for all registered letters. It sold for £48.20. Another attractive 1900 1/2d franking was this advertising cover for Tiptree Fruit Farm. Advertising covers are very collectable, and the more ornate they are, the more desirable they are. This one fetched an impressive £82.51. 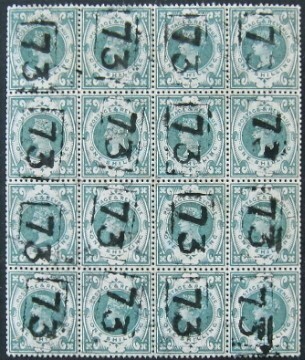 This impressive multiple of 16 of the 1s green sold for only £128.00. The “73” cancellation is a telegraph cancellation, meaning that this block would have been attached to a telegraph form and hence not postally used, which always reduces the price. However the block has very good colour which is difficult with this stamp as contact with water will make the green fade. 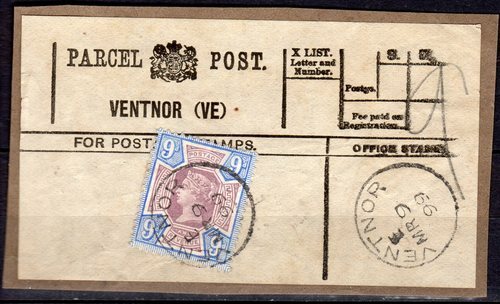 This parcel post label is a scarce single usage of the 9d purple and blue. 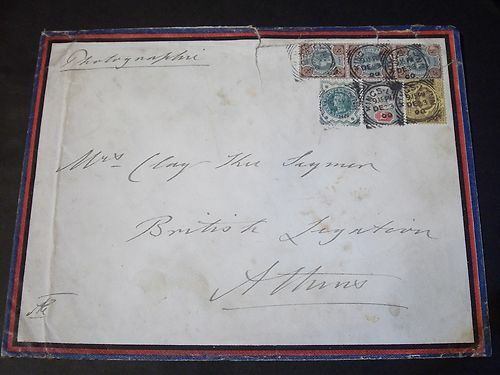 In unusually fine and attractive condition for a parcel label, it was no surprise to see this sell for £68.80. And finally this attractive multiple Jubilee franking sold for £63.95. Although a little bit grubby, the stamps pay a scarce high franking of 1s 5 1/2d to Greece.